Mostly business listing website offers local search information like city guides, events, festivals, parties, etc. 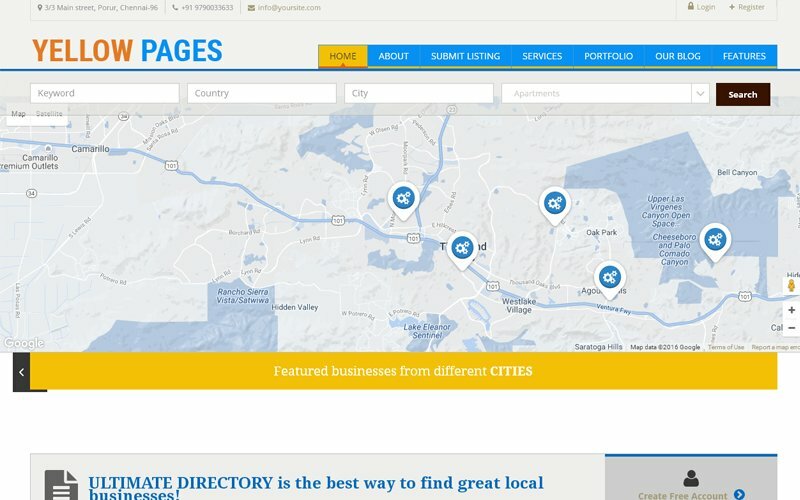 Our Business listing PHP Directory Script giving you world class best user experience and recommended to start website like yellow pages. Since Business Directory Script has huge revenue generation concept among other business models.Responsive design and user can easily post ad with simple steps. User have to register into the site with valid passes.In the home page, subsists of map that shows the business listing details. User can perspective the best places of all cities under some categories. Also can search through nearby locations. With the simple steps user can submit their company details by submit details page like basic details and upload any type of files for the viewer’s reference. In the detail page give about the business description and working hour’s details clearly with optimal working hours under desired category. In Business Directory Script, Membership plan can be upgraded as per the requirements, the payment mode are served through PayPal payment gateway. Interested user can register for newsletter for regular updates. Primary part of the website control comes under the admin. Admin have rights to control entire website like supervise the portfolio’s details and progressive search option that used to search a particular portfolio. Site management includes testimonials, image gallery, events, category and subcategory, location management, user management, payment gateway setting, and more. Through customization one can change payment gateway which is desired. All business listings are managed and approved by the admin. In the event listing, admin can manage the event categories might add new venues and offers CSV files format import feature. On moving to technical part,we have used all latest Google Algorithm techniques to adopt website to rank well which matches search engine crawling qualities. Search engine friendly and user friendly website leads to revenue generation which is directly proportional to business strategy. We are delivering the smartest PHP Business Directory Script which is derivedfrom 15 years of experience. We have handled many business listing stream, year by year mainstream based on the demand of market to feel a good new experience completely. In yellow pages software, we made it convenient usability for both user and admin for the journey of better local city guides.